have two new quick solutions that are also affordable. 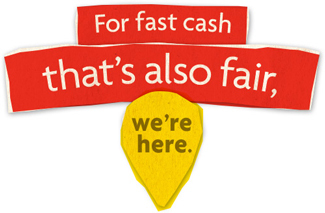 The payday loan alternative that helps you get back on your feet fast. Access to cheque funds the way it should be: without the wait, at no extra charge. Visit a Vancity community branch near you. Start your membership application with our online form. Vancity Fair & Fast LoanTM is a trademark of Vancouver City Savings Credit Union. 1 Certain restrictions and conditions apply. Vancity credit granting criteria apply. For more information and product terms and conditions visit your Vancity branch or call 604.877.7000, 1.888.Vancity (826.2489) or 250.519.7000. Most applications received no later than 90 minutes prior to branch closing time and not requiring any additional information or verification will be funded the same day. Applications received at other times or requiring additional information or verification may not be approved and funded until the next business day. 2 The annual percentage rate (APR) is compounded monthly, not in advance. APR assumes no fees or charges apply. If additional fees and/or charges apply, the total Cost of Credit and APR would increase. This product, its features and advertised interest rates may change at any time and may be withdrawn by Vancity at any time for any reason without prior notice to the member. 3 Quick access applies to adult retail accounts only. Either an acceptable credit history or three months use of account as agreed upon is required.